Coupon for free week of training for new students! New Karate and Martial Arts FAQ for new students. A unique community resource for over three decades. Founder George Takahashi has been a leader in the Southern California martial arts scene for over 35 years. Our fees are the lowest in the area. Instructors receive no compensation other than returning something of what they've gotten from the art. Fees go toward paying our facilities and equipment costs. Indeed, instructors and advanced students actually pay higher fees than beginning students to allow newcomers to investigate the martial arts as inexpensively as possible. 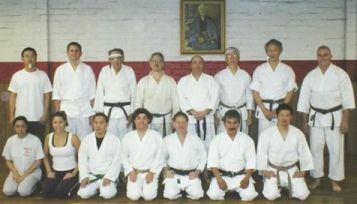 We emphasize mind and body development through the art of traditional Japanese Shotokan style karate-do (the way of karate). Visitors and observers are welcome. Please feel free to drop by as often as you like, and to talk to any of our students and/or instructors. You'll find us friendly and ready to answer any questions you have. Learning self defense via the use of attacks and defenses utilizing both arms and legs and sparring. The development of mind and body via formalized sequences of techniques (kata) and the practice of basic techniques and increasingly complex combinations of techniques. A philosophy emphasizing humility, self discipline and self growth with the aim of self enlightenment. Karate means empty handed. The significance of this is that we learn to defend ourselves without any weapons other than our own body, and also that we aim to empty ourselves of (human) vanity in the practice of this martial art. We strive to develop both humility and an indomitable will. Karate-do is the way of life of the karate practitioner. Shotokan karate is one of the largest and best known of the karate styles in the martial arts. It has been formalized and standardized since the early part of this century, and has given root to many other styles. Beginning classes are one to one and a half hour long, three times a week. Strength, cardiovascular endurance, and technique are developed gradually through both repetition and increasingly more challenging exercises. Training is divided into three major areas: basics (kihon), forms (kata) and sparring (kumite). Kihon consists of learning stances, defensive (blocking) and offensive (punching and kicking) techniques and how to maximize their effectiveness. Kata are standardized combinations of techniques grouped into a specific sequence (a martial dance of sorts). A karate style is passed on through the specific kata taught in that style. 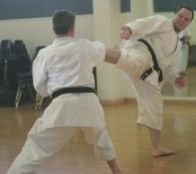 Kumite is practice of offensive and defensive techniques with a partner. In the beginning, this consists of a single preagreed upon offensive and defensive technique (one by each partner). At the highest levels, it progresses to the free exchange of multiple techniques between partners (free sparring). In addition to the these three major areas of training, self defense applications of karate techniques are examined and practiced. Ranking exams are held every three months (six months for blackbelt (dan) levels). At each new level, a new form must be mastered, and combinations of basic technique and sparring become progressively more complex. You should be in reasonable physical condition. If you haven't exercised for a long time, or have had health problems in the past, we recommend getting a doctor's okay before starting. You must fill out some quick paperwork (a standard release form and a general information form). Dues are paid at the beginning of each month. There are no contracts to sign. You may practice in loose fitting exercise clothing (e.g. sweats) the first few lessons. We recommend the purchase of a plain white karate uniform (gi), which you can purchase here or at any martial arts supply store. An assistant instructor will work with you one on one during your first lesson, and until you are able to follow along with the regular beginning class. Our goal is to provide a positive environment and experience for those who wish to learn something about the martial arts. The rest is up to you! Return to the West L.A. Karate home page. * "The West Los Angeles Karate School is neither sponsored by nor is it in any way connected with the YMCA of Metropolitan Los Angeles or the Los Angeles Unified School District." 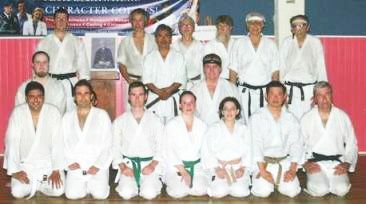 For further information, comments and questions you may also send e-mail to help@WLAkarate.com. but in the perfection of the human character of its participants."